I have cranberries, and I have cornmeal. 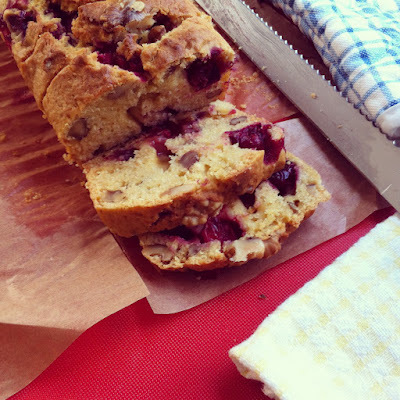 So when I stumbled upon Joy’s recipe for Honey Cranberry Cornmeal Quick Bread, I knew it’s the perfect way to finish off that bag of cranberries sitting in my freezer. What a perfect way to use up the rest of my cranberries. There’s the comforting taste of cornmeal, a hint of honey sweetness, the tartness of cranberries and the crunch of walnuts. It’s probably the most complex thing I’ve ever baked. Complex, as in the taste. Don’t let my fanciful description of the bread scare you away. This bread is nothing short of comforting. It’s great for breakfast, or as a quick snack on a rainy day. I freeze up all the leftovers, and they still taste as good after popping them in the toaster for a bit. I didn’t have any whole wheat flour that day, so I used all-purpose flour instead. I’m guessing they’d taste that much better if I were to use 50/50 all-purpose and whole wheat flour. Let me know if you tried this. Or, if you have any similar recipe, please do share! I love to make breads like this.